Vasaloppet 2919 offered solo victories in both the men's and women's class. Norwegian Tore Björset Berdal broke away with barely five kilometres left and could hold his ground for a victory in the men's class and Britta Johansson Norgren won the ladies' class after having been alone in the lead for almost the whole race. – I went all in. It was all or nothing, says Berdal about his victory push. – It was really tough today, but then it's even more enjoyable when it all works out, says Johansson Norgren after her second Vasaloppet victory. Preliminary figures show that 14,711 participants started in the 95th Vasaoppet in Berga by in Sälen. The 2019 Vasaloppet offered continuous steady snowfall and really slow tracks. For the most part it seemed as though the men’s class would be decided in a spurt on the finishing stretch but the Norwegian Team Koteng had other ideas. Last year the same Tore Björset Berdal was alone in the lead over the final 10 kilometres but he was caught up to at about the same place that he today made his breakaway push. – I’ve thought a great deal about what happened last year. It’s been chewing away in the back of my head. It was a tactic that almost worked. But this year I made a breakaway from that place instead of being caught up, says the 31 year old Norwegian. This time the tactic worked one hundred percent for the yellow clad Norwegian team. Berdal quickly got a gap of about ten seconds and Team Koteng had all the rest of the following group behind them. How did you plan your breakaway? – It was planned that we should push before the finish but not exactly where. The victory organizer was the team captain and threefold Vasaloppet winner John Kristian Dahl who gathered his men together out on the course and shared out his directives. – He got us skiers together and told us where we should be, “you should be in this track and you should be in that”, then he said to me “Tore, go now”. – So it was just to make for the finish! Your rival competitors were impressed that you managed to get such a big gap so quickly. – I just went all in. It was all or nothing! I didn’t know how near they were towards the end because I didn’t dare to turn and look. The first time I turned and looked was when I saw the Kranskulla. I was uncertain whether I could take the wreath or not. What does a victory like this mean? –There’s a World Championship in Seefeld right now which is the biggest for World Cup skiers. Vasaloppet is the biggest you can win when you’re a cross-country skier. It feels totally wonderful! And that you take up the whole prize stage? – This is really a team victory. It would never have worked without the whole team. And we also had completely fantastic skis today. In the group spurt behind Berdal it was Berdal’s team mates, Stian Hoelgaard and Torleif Syrstad, who were strongest and made sure there was a completely yellow Norwegian prize podium. Fourth was last year’s winner, Andreas Nygaard, Team Ragde Eiendom. 46 year old veteran in Nygaard’s team, Anders Aukland together with Öyvind Moen Fjeld from the same team, attempted to close the gap when Berdal broke away, but without success. Best Swede in the men’s class was Oskar Kardin in ninth place, 14 seconds after the victor, but only 3 seconds from the second place. – I was a little further back in the group when Berdal broke away. I thought it would be a big group spurt, and so did most of us. It was impressive teamwork by Koteng. They were quite simply better than us, says Kardin. – Anders and Öyvind skied with all they had to catch up but we were not good enough today, says Kardin. At Mångsbodarna after 23 kilometres Britta Johansson Norgren had a lead of 20 seconds from her biggest rivals Lina Korsgren, Katerina Smutná and Kari Öyre Slind. – After perhaps 18 kilometres I noticed that the best lads began to move forward a bit. Many of the good names began to search their way up so I also pushed myself hard. That probably made it for me today. When it was a long line after Risberg I had a very good position. And the distance just grew. Not so much in Risberg but in Evertsberg Britta had fixed herself a lead of two minutes from Korsgren and Smutná. This grew even more up to Oxberg in spite of Britta having to fight her way, in solitary majesty, up the Lundbäcksbackarna slopes. At the checkpoint her lead was 3.40. – It was unbelievably tough today. I have been extremely tired right since Evertsberg. It was a real struggle, but it’s even more fun when things go the right way. – I don’t usually feel I’m facing a wall but today I felt that there was a risk that I’d be parked there with 20 kilometres remaining! But when one is in good form it’s possible to keep on the right side of the line. At Hökberg the Smutná and Korsgren duo had caught up a bit and were less than three minutes behind Britta Johansson Norgren. But she held on all the way to the finish and the victory margin to the second place, Lina Korsgren, was in the end, 3.47. Smutná was two seconds later over the finish line as third. Four Swedes were among the eight best. – Tore Björset Berdal’s victory was the seventh men’s class win in a row for Norway and the tenth Norwegian men’s class win in Vasaloppet history. -For the third time ever it was three Norwegians taking home all the top three spots (this also happened in 2016 and 2017). – Stanislav Rezác, 45 years old, came in sixth place this time – he’s skied Vasaloppet 21 times and this is the 15th time he’s in the top 10! – The women’s class winner Britta Johansson Norgren has, since her Vasaloppet debut in 2013, placed sixth, second, second, second, first, fourth and first. – Only 80 men crossed the finish line before Britta Johansson Norgren. 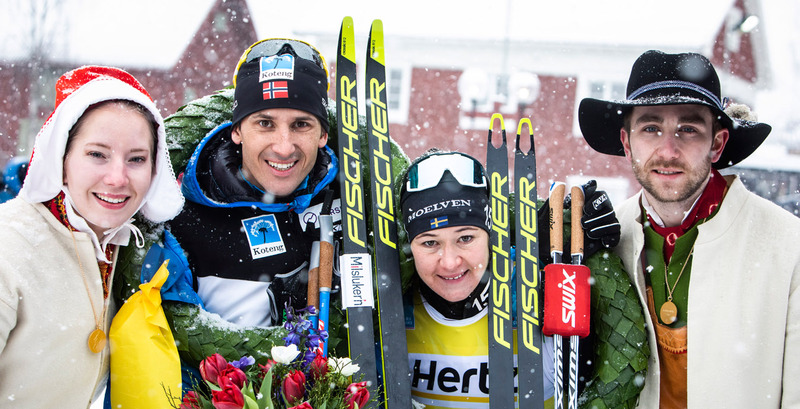 – Both the Kranskulla Emma Höglund and Kransmas Victor Sticko could give the winners their wreaths before they crossed the finish line. Skiers who complete the race in the winning time plus 50 % receive a medal. Watch Sveriges Television’s archived live broadcast of Vasaloppet. SVT’s various reports and interviews are added continuously to SVT’s Vasaloppet page. SVT Dalarna is gathering their reports from the Vasaloppet Winter Week 2019. Vasaloppet.TV broadcast all the participants crossing the finish line! Want to ski a race 499 years after Gustav Vasa’s adventure in Dalarna? Registration for Vasaloppet’s Winter Week 2020 opens on Sunday, March 17, 2019 at 09:00 on vasaloppet.se. Vasaloppet 2020 will run on Sunday, March 1, 2020.